Wow, Oracle is planning to release a free version of their database to compete with open-source databases like MySQL. Here’s a great post about exceptions vs. status codes. The author is very much in the exception camp but he cites a Joel on Software post that argues against exceptions and there is some interesting discussion in the comments. The good news is that they have breakfast. The bad news is that it wasn’t very good. The hashbrowns were lacking in flavor and they didn’t know what a chai latte was so the end product ended up being something akin to a glass of hot milk with a shot of chai. Did you know that Bruce Springsteen wrote “Blinded by the Light” – that weird song where everybody mishears the lyrics? I had no idea. I’ve only ever heard the version by Manfred Mann. Thanks to Joe for pointing this out to me in the comments on another post. 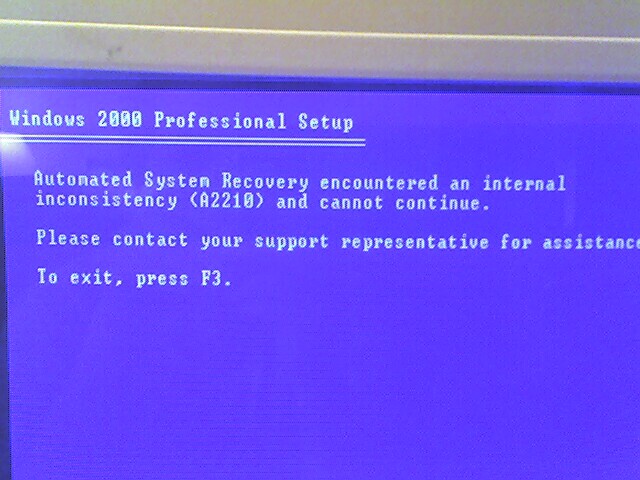 I was hoping to repair my Windows 2000 installation using the CD, but it just not was happening. I’m in class all-day today (yes, Saturday – yuck) learning about project management with Microsoft Project.